After Ernie came out of the Army trying to find somewhere to live was difficult. His wife, while he was still in the army, lived with his parents at 55 Church Road. To have a place of their own Ernie and Maureen (nee Devine) bought a caravan at Dark Lane. The Rogers family by this time had two sons, the older son Trevor took these pictures aged 7yrs. 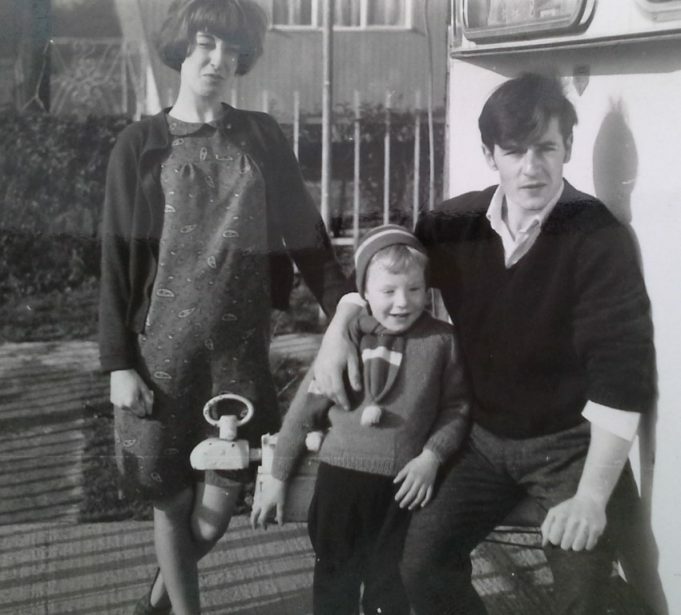 Maureen and Ernie Rogers with their son David at Dark Lane, 1961 - 1964. How accommodation was difficult to get, how the site was very much a community. My family lived in a caravan in 6th Avenue in 1988, while the Council were looking for property for us; when was it turned into holiday homes? l was born in a caravan on the Thundersley caravan site. I lived there until l was 12 years old. It was a safe place to live, as we’d just be able to get up and run outdoors without any supervision of parents and come back just as it was getting dark. Hardly anyone had cars on the site in those days. The site was surrounded by horses fields on two sides, an orchard on another and a children’s playing field on the other. ‘Dark Lane’ was reached by a cinder track along one side of the site, which lead to our infants and junior schools. No need for transport, we could walk to school on our own, which was only about a quarter of a mile. My love of horses began here. I have 3 driving horses and horse drawn gypsy caravans to this day. Also a love of wildlife and nature, as it was all around me. There was a lot of stigma attached to the caravan site dwellers in those days, however. At school I’d be called ‘Dirty gypsy’, which was when I first discovered discrimination. Up until then, it was heaven for us children, running around free and wild! It formed who l am today and I’m so grateful for it. It was truly an alternative way of life, born out of my parents necessity to find accommodation, when the only alternative was ‘rooms’ in squalid conditions, with no gardens. My mother bought the caravan and paid weekly for it, with ground rent on top of that for the pitch. We had no running water until I was about 12; I used to fetch and carry all the water from a stand pipe on the site. There were toilet-blocks and Elsans, too. We had a bath-block, which was a building containing several baths, where we’d go for a bath on a Friday night, with a lady supervisor, who took our money; sixpence, in old money. There was also a tin-hut hall, where childrens parties were held, which were big affairs, with all the children of the site attending in their party dresses. It was an eclectic mix of people; old single men and women, young families, Indian and Irish; ‘proper’ gypsies, an old Jewess called Ida, who lived in a tiny caravan, full of newspapers in stacks, surrounding her…..‘Ida, the spider, sweet as apple cider’, we’d call out to her, to which she’d fling her door open and shout ‘Clear off’, which made us worse….cruel kids! There was a single woman and her 6 children, all living together. There were the ‘dancing teachers‘; two elderly lesbians, who lived opposite but one to us and another couple of gardening lesbians who lived directly opposite to us. Many, many more characters, too. We also had a warden, who looked after affairs of the site. I remember when the steamrollers came to lay the tarmac avenues on the site. I loved the smell of the tarmac and would sit on the ground beside them, just watching it all going on. We also had a ‘dump’, for rubbish, where my dad found my first rocking horse. It was an old fairground one and l loved it; quite large and wooden. I had a Terrier dog several cats, bred Dutch rabbits, had guinea-pigs, tortoises. Delightful! 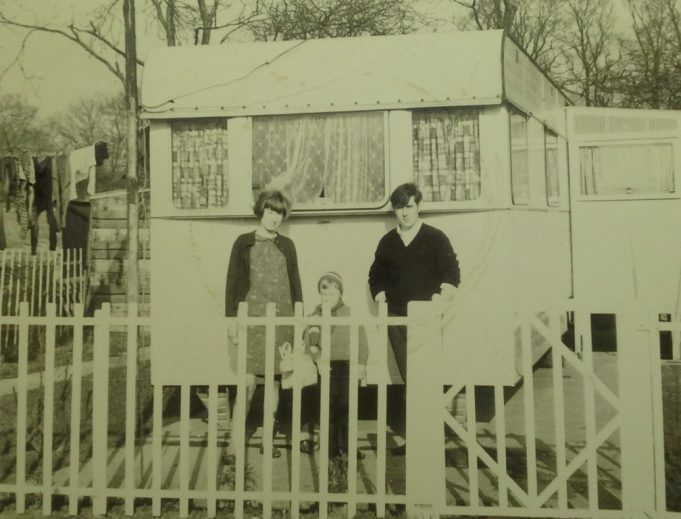 Our family moved into the caravan site in the very early fifties. Our address the was No. 9 Caravan, Hart Road, Thundersley. At that time there was no electricity and our caravan had a solid fuel ex-army heater and all cooking and lighting was by Calor Gas. We did not have a television so the only entertainment was a radio which was reliant on glass celled wet batteries for power. We had two accumulators one for use while one was at Partridges Electrical store for charging. Partridges was along Hart Road between the school and the old Church Hall (which was a wooden lined wriggly tin sheet construction) at the junction of Kenneth Road, Church Road and Hart Road. Next to the electrical shop was the barbers, which I think was still a barbers a few years ago. Also at this junction was Pond’s grocery store where we would need to have our ration cards, as things were still rationed in the early fifties. As a young boy I well remember the roads being laid at the caravan park as there were none when we first moved there. Electricity was installed in the mid-fifties and each caravan was allowed a maximum of 5 or 10 amps load which wasn’t very much but it was nice to have electric light. As the site expanded they gave each line of caravans a street address, so we became No. 9 First Avenue, Caravan Site, Hart Road, Thundersley. I went to Thundersley Primary School at the top of Dark Lane, where the Headmaster was Mr Clough. I used to attend the 2nd Thundersley Scouts which met in the Church Hall. My sister also went to the school and she also was in the Girl guides who met in the wooden buildings on the right as you entered for the old main gate.